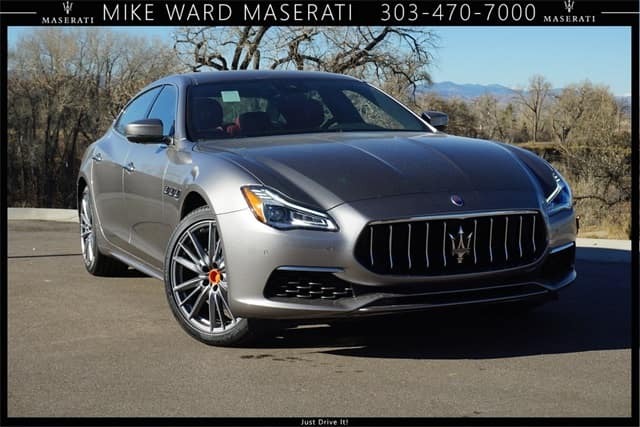 The 2019 Maserati Quattroporte inventory has just started to arrive at Mike Ward Maserati of Denver. That means you can experience this luxury performance sedan for yourself at our Highlands Ranch showroom. The 3.0-liter twin-turbocharged V6 creates an impressive 424 hp and 406 lb-ft of torque. Or you can choose the amazing 3.7-liter twin-turbo V8 engine for an even more exciting driving experience. No matter which you choose, you can expect the distinguished exhaust note that can be none other than the powerful Maserati engine built by Ferrari. The Quattroporte also offers drive modes, including normal, sport, off-road, and I.C.E. (Increased Control and Efficiency) so you can personalize your drive. The Skyhook performance suspension with electronic dampening control provides amazing handling in any road conditions. Choose the S Q4 for the capability of the Q4 intelligent all-wheel drive system. Visit Mike Ward Maserati today to see our first 2019 Maserati Quattroporte S Q4!